B·Hype M mixes the professional acoustic performance of the B·H family with the most advanced versatility of a complete portable PA equipped with a wireless microphone system, audio media player with Bluetooth connection, SD card and USB port, a long-lasting battery, wheels and a retractable top handle: all you need for a professional performance on the move. A perfect solution for buskers, education or anywhere that requires decent quality audio on the move. The system is equipped with: one 1” compression driver and one 10” woofer. 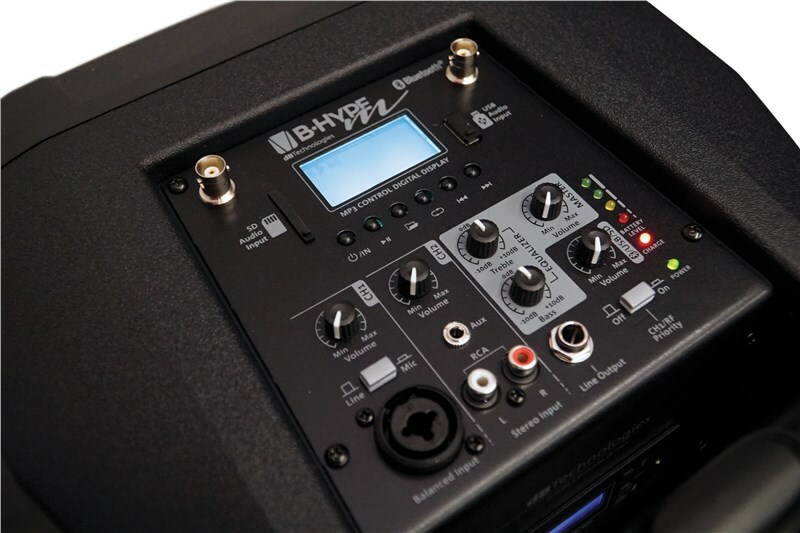 The input section allows the user to connect: up to three wired inputs, one wireless microphone, and different media inputs (including Bluetooth® ). Users can also connect the audio output to a second speaker. The control section is equipped with an equalizer and a CH1/RF priority function that attenuates the level of every channel but Channel 1 and the Radio microphones for a smooth automatic ducking effect. The sturdy and compact cabinet (only 12.5 kgs – 27 lbs) is equipped with wheels and 3 handles (1 per side and 1 retractable on the top). A 36 mm pole mounting also allows use on a speaker stand. B·Hype M HT Bundle comes with a wireless handheld transmitter.